OSWEGO – The Lake City Police Club recently voted unanimously to endorse Billy Barlow for a second term as mayor of the city of Oswego. From left are: Thomas Grover, Scott Smith, Zackary Quinones, Mayor Billy Barlow, Kevin Hadcock (union president), Bryan Thompson and Justin Grasso (union vice president ). 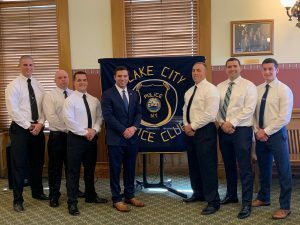 The LCPC, formed in 1937, is comprised of 43 members and serves as the certified bargaining unit representing all police officers, sergeants and lieutenants of the Oswego Police Department. The LCPC endorsed Mayor Barlow’s bid for a second term in City Hall, citing his administration’s unwavering support of law enforcement throughout his first term and reaching a fair contract during last year’s negotiation process, as reasons for its support. “I look forward to building on the progress of my first term, as we continue to use law enforcement as a key component of our efforts to revitalize neighborhoods, protect the community and continue moving our city forward,” Barlow added. Mayor Barlow, a Republican, took office in 2016 and is up for reelection this November. There is currently no candidate opposing Barlow, with petitions being due earlier this month.